These surgical products are standard one piece handles with swivel barbs that allows for easy turning of the handle. These surgical instruments are part of the two piece liposuction cannula. The hub of these liposuction cannulas is made of 304 stainless steel with 1/2 - 10 acme thread and 7/8" diameter. The handle is made of delrin with a 7/8" diameter. There is a ribbed style for an easy grip. It is autoclavable. Available in black or white. The quick disconnect handles are surgical instruments designed for surgeons that want to quickly disconnect tips and change to other various tip styles. The standard 303 stainless steel Toomey base built to last long. Fits MONOJECT 60cc Toomey Syringes. Three openings in a triangular pattern. Our most popular tip design. Flare Mercedes facilitates breakdown of tissue prior to aspiration, increasing speed and efficiency in a wide range of procedures. "V" shaped with two side port. Featuring three ports in a circumferential pattern near the distal tip of the shaft. Wedged tip with one slot, two big holes, and two small holes. These brushes are designed for cleaning liposuction cannulas. 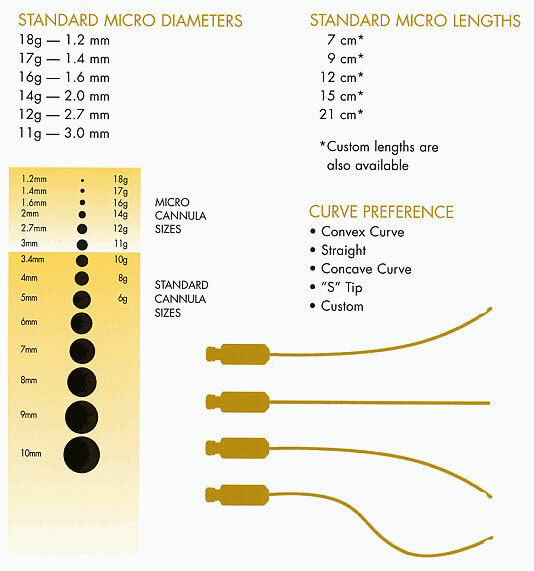 They are available in a variety of lengths and diameters to suit your needs. The bristles are made of nylon and the extension tube is made of 304 tubing. The handle is made of delrin and has a 3/8" diameter for easier handling and twisting with fingertips during cleaning.